A spectacular find has been made by the Biggar Archaeology Group at their excavation of two Bronze Age houses within Fruid reservoir near Tweedsmuir. We have been working on the site since 2003, gaining access to it only in late summer when the water level within the reservoir drops. We have nearly completed the work, revealing the plans of two timber round houses. Numerous pottery sherds and some coarse stone tools have been found. Recently we got a large saddle quern, a stone used for grinding grain. We know the houses date to the Bronze Age some time between about 4000 to 2500 years ago, and we shall certainly date some of the charcoal we have retrieved allowing us to refine the dates to within about 50 years or so. We now already know that they date to the middle of the period, around 3500 years ago because of a single find. That find was made by Ian Paterson, a retired geologist from Edinburgh. Ian continues the story; “I was digging out part of a deep drainage gully when the distinctive green colour of bronze appeared. 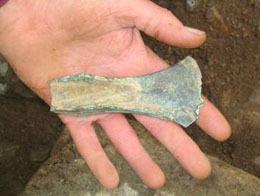 The axe is of the type known as a palstave and is flanged to take a forked wooden handle. They date to the mid Bronze Age, so at a stroke we have a rough date for the houses”. Ian stated that he been digging now for four years and had never found anything so exciting, Tam Ward riposted “I’ve been digging for thirty years and I am still waiting for my find of a lifetime!”. 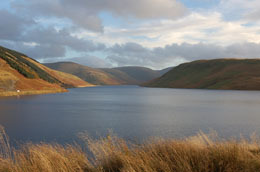 The excavation is part of a major project on the ancient history of Upper Tweeddale and has about a year still to run. Sites found by surveys in the Tweed reservoirs and in large tracts of forest in their vicinity which have been found to be badly damaged and we are racing against time to salvage all the evidence we can. Most of our work is very exciting but finding something like this is the icing on the cake. We are sure there are still many more discoveries to be made that will throw further light on the ancient past of Tweeddale.